Lexbridge is proud to announce that our firm has partnered with the Australian Chamber of Commerce and Industry (ACCI) to establish the ACCI-Lexbridge Trade Law Support Service. 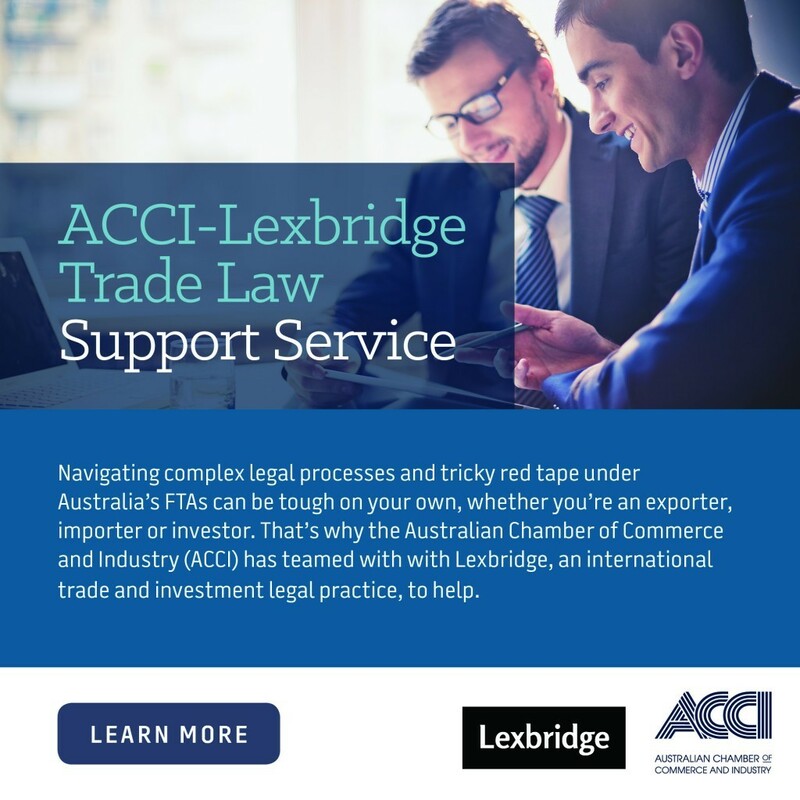 The ACCI-Lexbridge Trade Law Support Service aims to leverage Lexbridge’s unique expertise in trade and investment law issues to advise Australian businesses on maximising the benefits flowing from Australia’s Free Trade Agreements (FTAs). Do you want to use Australia’s FTAs for imports, exports, services, or investment, but don’t understand the legal processes or red tape? If you already use trade agreements, do you want to maximise their benefits for your business? The Trade Law Support Service assists businesses to navigate the complex legal processes and rules under Australia’s FTAs, whether you’re an exporter, importer or investor. – Explaining the meaning and effect of any other part of trade agreements; and – Offering broader advice to help you take advantage of trade and investment opportunities.